Bruce Cartwright introduces the CA Agenda of Technology, Trust and Talent. He describes how far we have come - from papercuts and suitcase-sized computers to 10 second soundbites and a need for continuously developing talent. You have the talent and intelligence that will help drive this programme, so get in touch and share your thoughts and experience. Barry Melancon, CEO of AICPA, is often quoted with the phrase “the pace of change will never be slower”. How right he is. I ask our younger members to indulge me for a moment, my contemporaries to take a walk with me down memory lane and my senior colleagues to recall their experience of starting out as a young CA. When I qualified as a Chartered Accountant (almost 30 years ago) an audit involved, among other matters, taking a sample survey of x% of the purchase ledger – and manually pulling the documents out of lever arch files. The random sample was selected by a suitcase-size green-screen computer that required heavy lifting to bring on site. Today, provided certain parameters are met, the auditor may be able to subject an entire population of purchase invoices to detailed testing. Of course, this by itself may identify a number of outliers that may require further inspection but at least the days of meticulously trawling through samples and (thankfully) the ensuing papercuts may be drawing to a close. We have started down a path towards technological singularity. And when we reach our destination, robots will have surpassed humans in their ability to “think” and create. I use the word “think” cautiously because there are debates about how much a robot (as we know it today) can think beyond how it is programmed. Do we panic, down tools and head for the nearest job centre or do we choose to embrace change? It can certainly develop its thinking based on its increasing experience but there is a need to beware the potential AI (machine) bias that can be present in both the data that AI consumes and in the algorithms used to analyse the data. I am sure you have all read the doomsday headlines about the fate of our profession or even taken the “Will a robot take your job quiz” on the BBC, which predicts that there is a 95% chance that our jobs will become automated. However, this of course depends on the level of professional judgement involved in the role concerned and the extent of human interaction. How should we react to this? Do we panic, down tools and head for the nearest job centre or do we choose to embrace change? The question of how technology will impact the accountancy profession is one of three big challenges confronting us – the other two are the impact of declining trust and how the talent pool responds to technological advancement and diminishing trust. 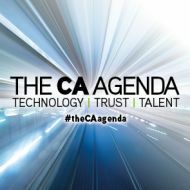 Altogether they form the basis of our new thought leadership initiative, the CA Agenda. Hugh Shields CA, Special Consultant on Technology and Artificial Intelligence (AI) for ICAS, was one of three presenters at our CA Agenda launch event at St Pauls Cathedral. He believes that technological advancement is an opportunity for us to shape our own destiny. Over the past 30 years, I have witnessed the move from manual to machine; my experience compels me to agree with Hugh. I believe that we are agents of our own change and that technology will help us create a new future for our profession. But, as the CA Agenda highlights, the unstoppable march of technological advancement isn’t the only challenge confronting us. There is another fork in the road: the decline of trust in government and business. The system must work for all and we need to be careful it is not self-serving. But in a world of fake news and 10-second soundbites, in which reputations can be made or broken by a 280-character tweet, we must work hard to convey our message: the desire to do better in the interest of the public. So, we have technological change, against a backdrop of declining trust in the system – how do we rise to these twin challenges? This is where the third strand of the CA Agenda – talent – comes into play. Group CFO of Vue International, Alison Cornwell CA, our final speaker at the CA Agenda launch, challenged the audience to identify what we can do that a machine can’t. We need your help to find the solutions. Alison explained that our time should be spent on analysis and communication of information and not on the production of that information (how far we have come from my days of manual audits!). While the world around us has changed, in terms of what we do and how we are perceived, the fundamental building blocks of our training – the analytical rigour and emotional intelligence built upon an ethical bedrock – have equipped us to not only deal with this change but to be the innovators of future change. So, we have set out our CA Agenda. There are fundamental challenges facing our profession and we need your help to find the solutions. To Barry’s wise words, that the “pace of change will never be slower” let me add, so let’s set the pace.